Live streaming ...thanks to DR! The Sea Stallion is an archeological experiment at sea. 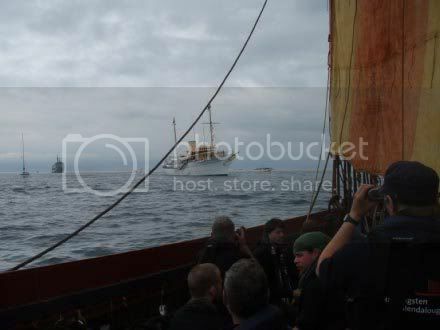 The project is based at the Viking Ship Museum in Roskilde and is a recontruction of the Skuldelev 2, a warship built in Dublin in 1042 in the Late Viking Age. The original was intended for crossings of stormy waters and open seas. The reconstruction experiment has been underway since 1996 and aims to test a Viking longboat of the era, the seamanship and logistics of sailing the vessel and what light it might shed on Viking society. It will be tested in the seas for which the original was built - the North Sea and the Irish Sea. The reconstruction journey is now at a new stage with the reconstructed ship built, tested and the volunteer crew selected. The journey has begun with this voyage from Denmark to Norway. 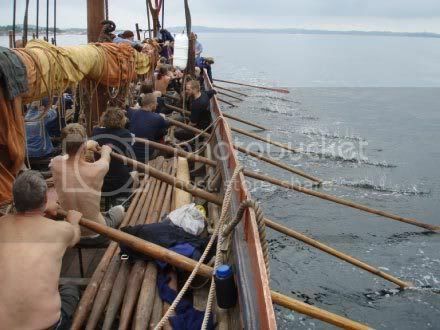 The voyage this year will be the trip from Roskilde to Dublin and then in 2008 the return journey from Dublin to Roskilde. Crown Prince Frederik is the patron and is expected to go to Dublin to mark what is being described as the most significant archeological reconstruction ever undertaken. 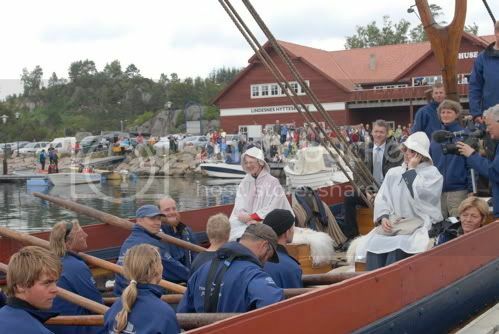 The Sea Stallion meets up with the Dannebrog which is in Norwegian waters for the birthday celebrations of Queen Sonja. 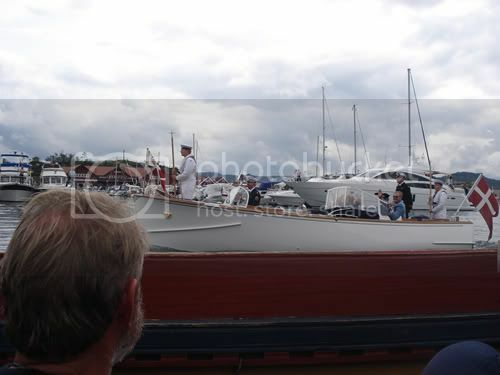 Queen Margrethe, Prince Henrik and Queen Anne-Marie transferred from the Dannebrog to the Sea Stallion in Havhingsten, Norway. After the terrible weather of the last few days, the ship was today blessed with good fortune. 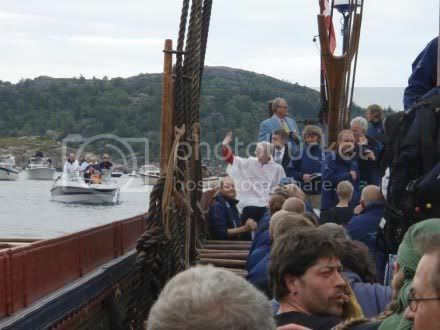 Last night they arrived at Lindesnes at the southernmost point of Norway. Here there are was once a Viking canal. 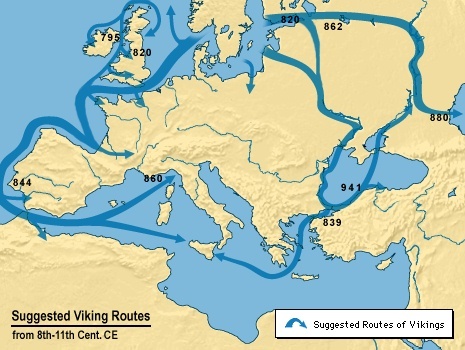 This channel was built to allow Viking ships traveling along the coast to cross a narrow spit of land, saving them a considerable journey around the peninsula. The canal is thought to date back at least 1200 years, making it older than the original Viking ship itself. Over the centuries the canal silted up until almost no trace was left. After its discovery and excavation in 2001 the decision was made to re-dig the canal and today is the official opening day of restored canal. What’s more, the Queen of Norway is on a birthday cruise in the area and she’s here to open the canal along with her birthday guest, the Queen of Denmark. 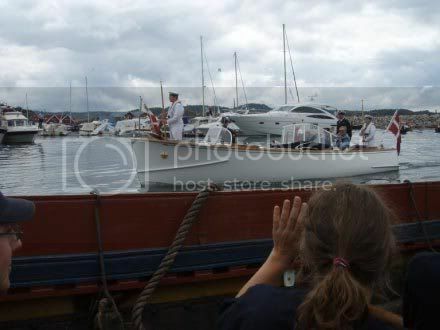 The Royals arrived in their respective yachts this morning and the Sea Stallion went out to greet them. The Sea Stallion was dwarfed by the huge royal ships, but was gaining at least as much attention. Following the opening ceremony, in which the dignitaries sailed down the canal serenaded by dancing Vikings, the Queen of Denmark came to see the Sea Stallion up close. Carsten offered to sail her out to her waiting yacht and, departing from the official schedule, she accepted. Whilst the Viking Ship may not be quite as comfortable as she’s used to, the welcome she received on board more than made up for it. The Queen takes a keen interest in archaeology, and plied the crew with questions about the ship and life on board. Her husband, the Prince, is himself an accomplished sailor and couldn’t resist taking a turn on the tiller. For the Viking Ship it’s a huge morale boost (as well as a great photo opportunity). Now they’re hoping that their good luck will rub off on the weather. Can you speak Viking? Lots of words in English were adopted during the Viking age: sky, yacht, happen, lake, wind ... far too many to mention, so check it out here. 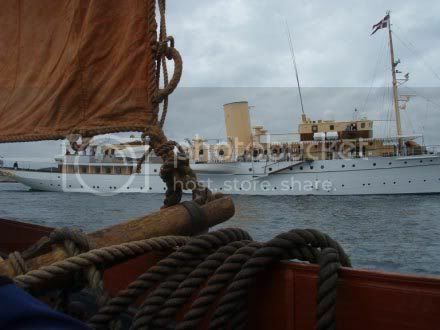 Added: DR1 video clip of the Queen, Prince Henrik and Queen Anne-Marie onboard the Sea Stallion. And to Janne, as always, thanks!